Your lover is a unique soul, truly one of a kind. Gentle yet strong. Kind yet firm. Compassionate and bold. 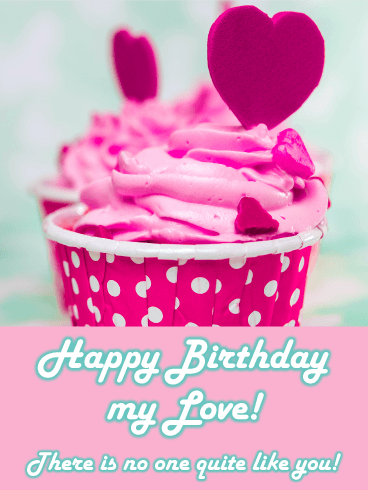 Show your love this birthday by sending them this tasty cupcake Happy Birthday card. With soft, pink frosting and sweet birthday candles that spell out “I heart u” there will be no doubt in their minds how much you care! A vintage bike on a quiet, beautiful beach. And what is that tied to the bike? An incredible bouquet of colorful balloons! Why this must be a birthday card! 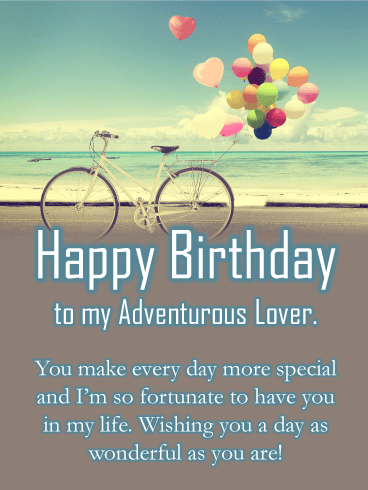 Send this classy card to your adventure loving darling! They make every day that much more special and you want them to know how lucky you are to have them around! Bow WOW! Is your lover a lover of silliness? We’ve got you covered! 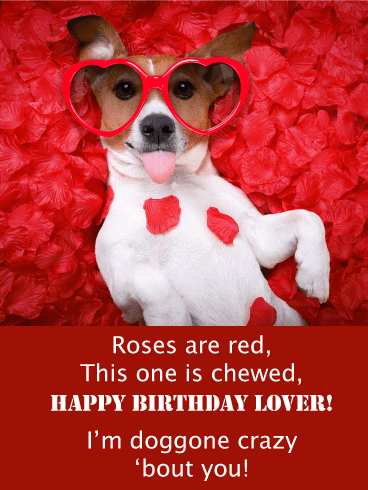 This super silly dog-themed birthday card and poem will have your lover rolling with laughter! Roses are red, this one is chewed, Happy Birthday Lover, I’m doggone crazy ‘bout you! 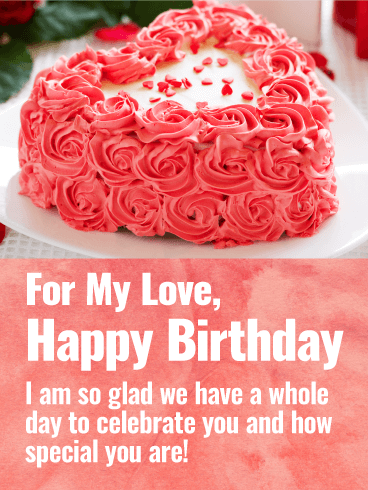 The perfect balance of romance and fun, send this birthday card to make your lover’s day even brighter! It doesn’t get much sweeter than this cute birthday card with its super fancy “Love U” heart cupcake! Perfect for sending to put a smile on the face of your total sweetheart! 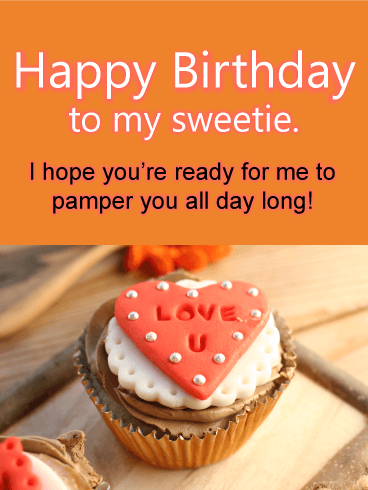 Send this sugary confection happy birthday card to sweeten up your lover’s day, and get them excited for the day of pampering you have planned for them ahead! Cheers! 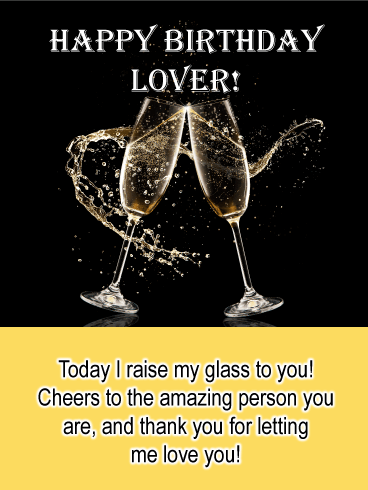 Raise a toast to the one that you love the most! 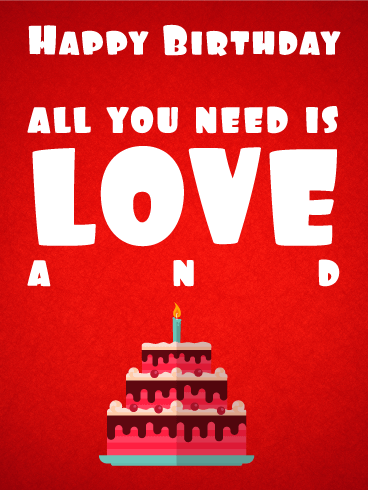 The Beatles sang that “All you need is Love” and you tend to agree! 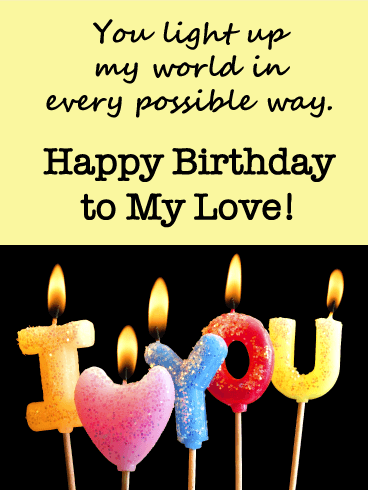 Now choose to send this charming happy birthday card to the World’s Best Lover—yours! With its clinking martini glasses and bright red hearts it does a phenomenal job of expressing your feelings of bubbly love! Dripping with rustic charm, this tasteful Happy Birthday card is perfect for the one you love on their special day. A polka-dotted gift box, a bouquet of freshly picked pink tulips, and a wish for a day of joy and bliss. 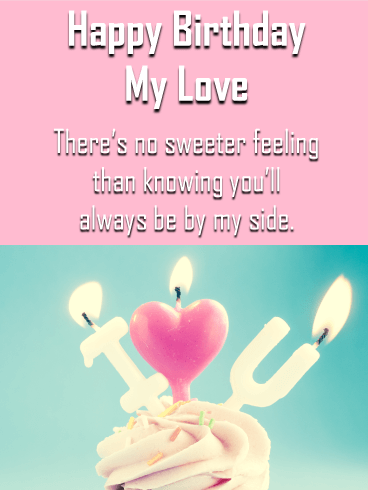 Send this darling card to let your lover know how important they are to you and how much you care for them. What’s better than champagne for an important celebration? Not much! Perhaps champagne AND a thoughtful greeting card?! We think YES! 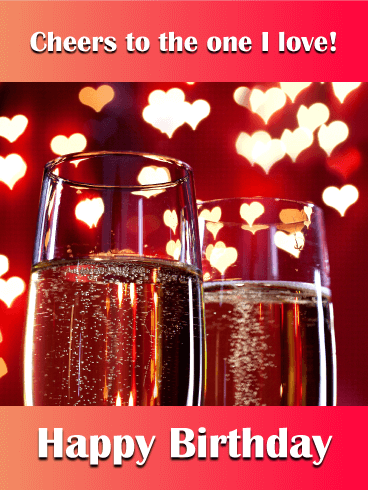 Send the champagne toast happy birthday card to your amazing lover before you pop a real bottle of sparkling and get the party started! The wish includes a thoughtful thank you to the receiver for letting you love them, awwww! 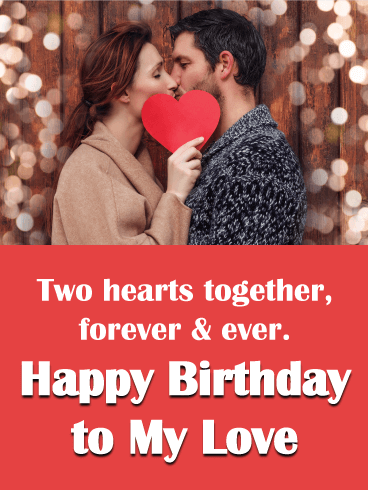 How to wish a happy birthday to your lover in 2 easy steps. 1. Find the perfect card. 2. 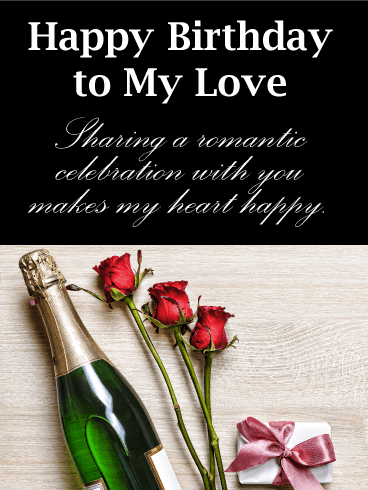 Send that card to your love! And we’ve already found the perfect card for you here! In cheerful colors and covered with presents, hats, and balloons the best birthday party card is ready for sending! And bonus! 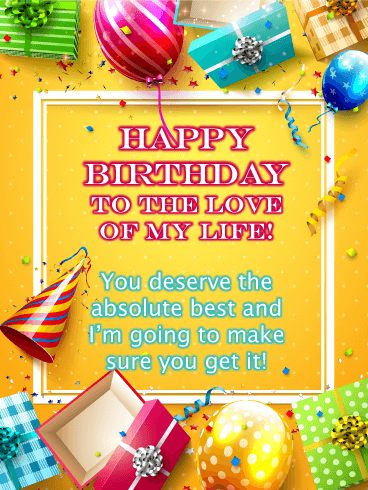 It already has a wonderful wish on it about the love of your life deserving the absolute best! 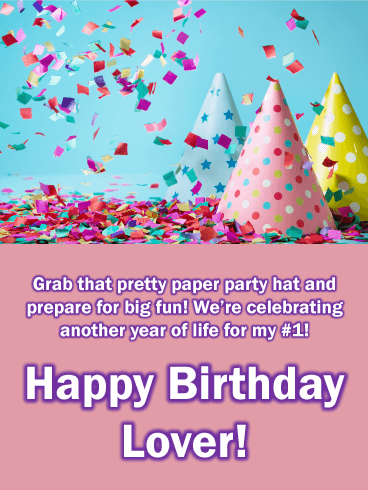 Grab that pretty paper party hat and prepare for big fun! We’re celebrating another year of life for my number one! That’s the super awesome, rhyming wish on this pretty party hats birthday card. We think it will bring a smile to your loved one’s face! Now send them this bold, confetti-covered card, slice up that cake, and get to the celebrating! Your lover is your favorite person, and on your favorite person’s big day you want to send the most special card you can find, right? Send your flawless lover this adorable photo birthday card of a couple in love walking with a bunch of balloons. 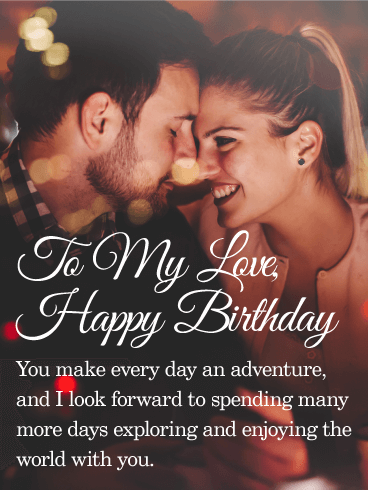 The birthday wish let them know your true feelings about how they make every day a treasure and there’s no one else you’d rather walk through life with! The "porpoise" of this awesome birthday card is to wish someone a fin-flipping good time! 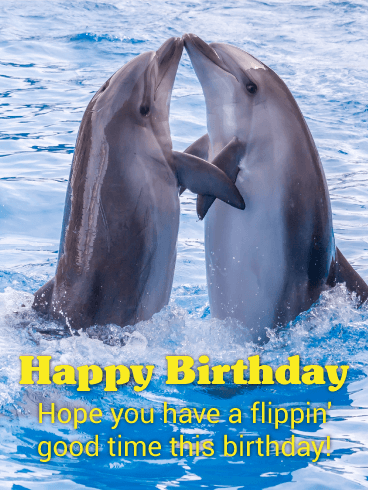 Dolphins are all about fun and play, and that's what birthdays are all about too! Perfect! Send this cool birthday card to anyone who loves a good frolic whether on land or on sea! It's playful, it's silly, it's fun-it's the perfect birthday card for those who don't take life too seriously. Do you love to celebrate your sweetheart's special day with sweet treats? This birthday card uses lush imagery of a heart-shaped cake, decorated with pink roses, to invoke the idea of sensual celebration. Let your love know how eager you are to cherish them with roses and hearts to create a sense of continued festivities. 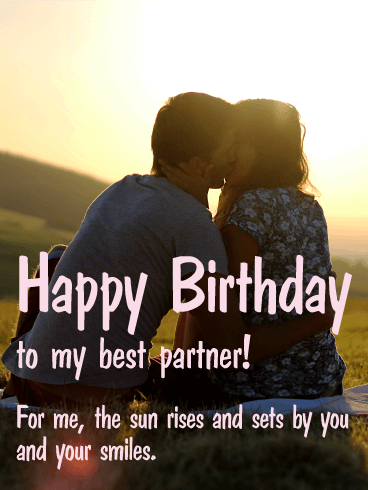 This birthday card is perfect for those couples with an undying romantic streak! A man and a woman sit comfortably on a couch as the man offers a jewelry box and a bouquet of lush red roses. 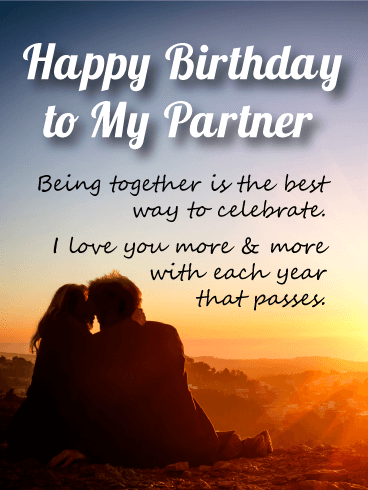 If you want to give your partner the world in appreciation for all they do, this birthday card will help you to express how special they are to you. 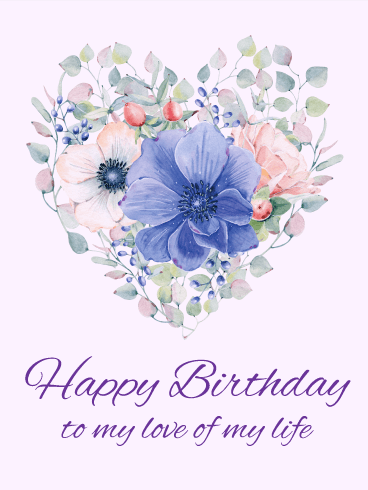 Pair this birthday card with cozy kisses for maximum effect! The lovely golden glow of sunset pales in comparison to your love. 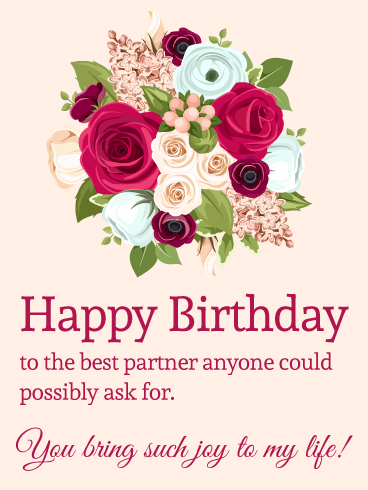 Wish your partner happy birthday with a card that's sure to bring warmth to their heart. A young couple kiss sweetly in the fading light, and a message conveys the importance that your lover has in your heart. On the top half of the birthday card, a pair of grey tabby kittens cuddle nose-to-nose in a basket. 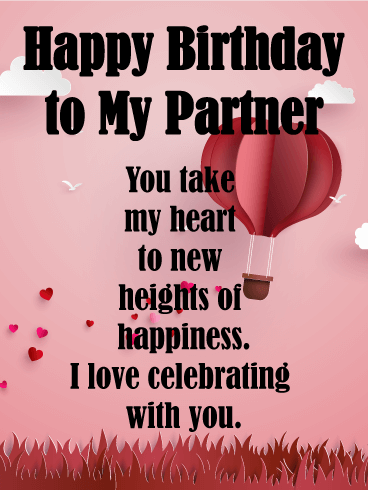 On the lower half, a birthday message lets your partner know how much you enjoy the special little moments. 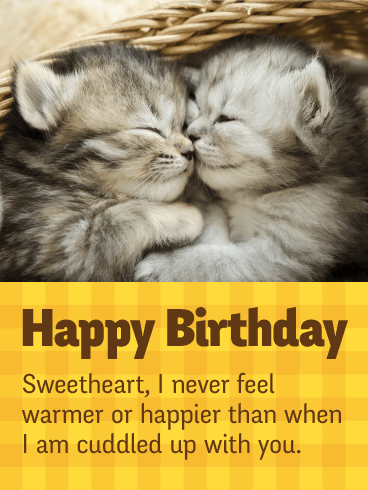 Make your lover smile and want to curl up with you right away with this birthday card! 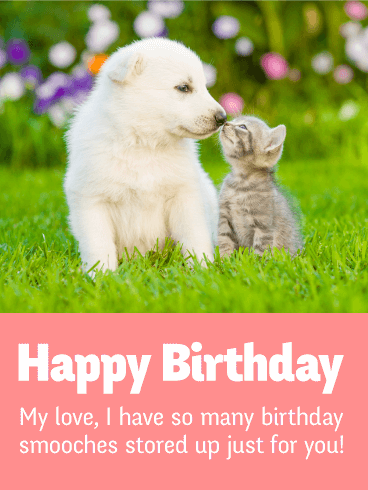 On the top half of this birthday card, a puppy and a kitten "kiss" nose-to-nose, sitting on a lawn, with flowers in the background. 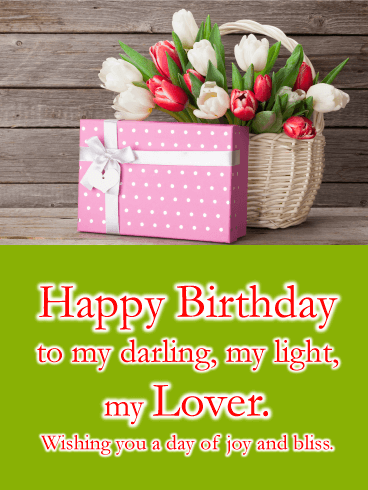 For a cheerful birthday message, choose this birthday card! 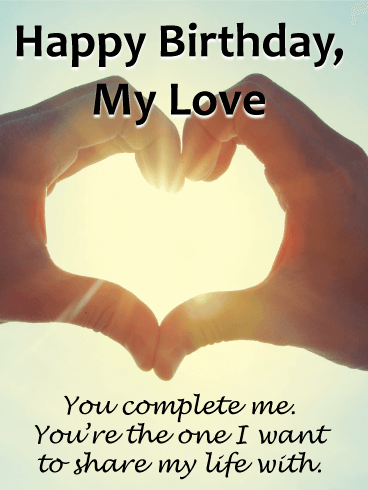 Your partner will delight in this expression of love, delight, and companionship. Express your love with the simple elegance of a heart composed of flowers and leaves. 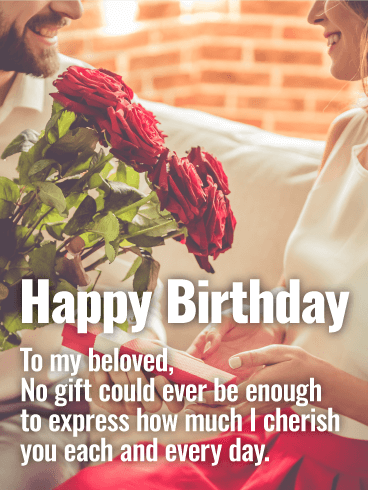 The text of the birthday card wishes happy birthday to the love of your life. 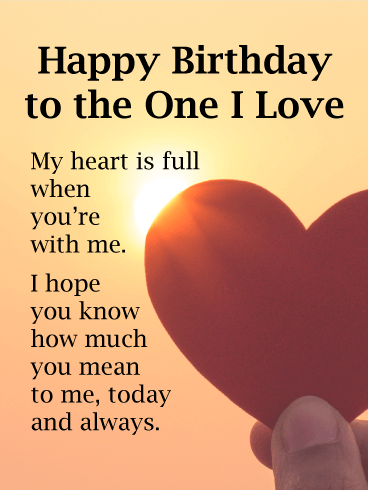 Select this birthday card to tell your one and only how special they are! 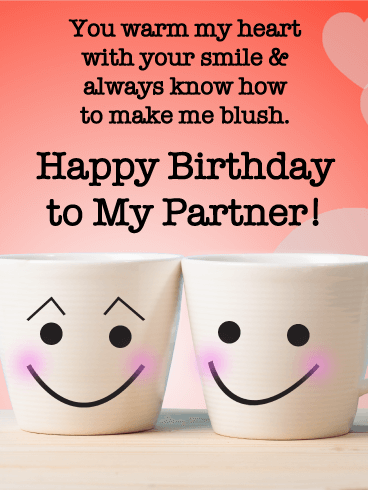 On your partner's birthday, express your appreciation for all the wonder and delight that they bring to your life! A bright bouquet of artistic flowers stand out against a parchment-colored background. 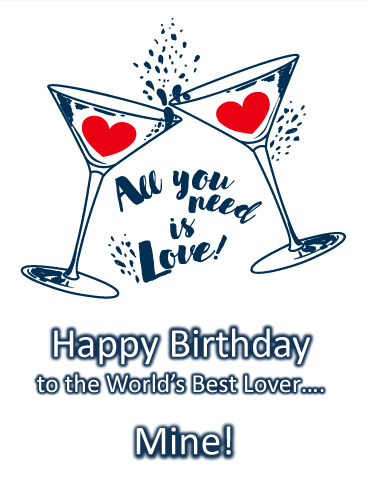 On the lower half of the birthday card, a message expresses your affection and delight! 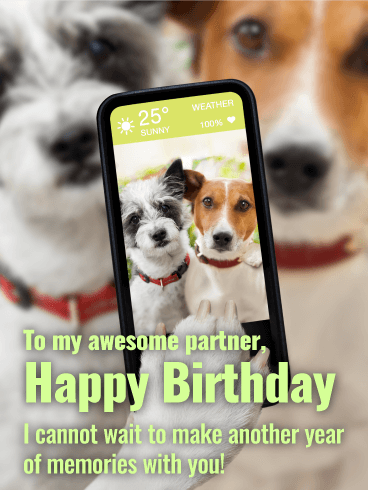 A birthday card for the social-media savvy couple: a pair of alert, affectionate dogs take a selfie on a smartphone. If your sweetheart has never met a hashtag they don't like, then this birthday card is sure to bring a smile to their face! Text on the lower half of the birthday card tells your partner that their sheer awesomeness means they'll always be a part of your throwback-Thursdays. Celebrate their birthday and start building some memories!